If you hear the word dessert then which scenario plays on your mind? It must be something, sweetened, soft and creamy. 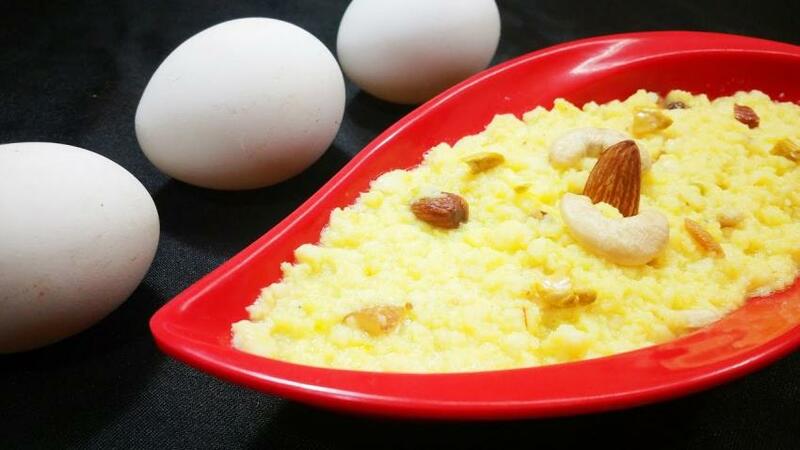 Egg Halwa is this type of desserts which is simultaneously sweet, soft and creamy, and this is the easiest dessert too. So, don't wait and attempt this easy recipe today, and enjoy with your loved ones! Put a large pan on medium flame and heat ghee in it along with sugar. Stir continuously until the sugar crystallizes and turns into lumps. Then, add semolina in the pan and fry on low flame till the colour changes to golden. Now, take a bowl and crack eggs in it. Beat them well using an electric beater and add milk to it. Whisk once again till the mixture is creamy and fluffy. Add this creamy egg mixture to the pan and stir continuously on medium flame till all the milk is dried up. Stir to mix all the ingredients and turn off the burner. Garnish with dry fruits of your choice and serve hot.